Chemical compounds (or actually chemistry in general) were never my strong point. I never understood why certain things could not go together, what made elements positive or negative or why it was frowned upon to spell things from the periodic table of elements. Science and I are not cut out for each other. Baking and I however, we go hand in hand. In a way baking is like science: specific measurements, following directions to a T, and adding things in a specific order so you don’t cause an explosion because apparently that (while amusing) is frowned upon also. My first revelation that science and baking are similar was when I was in third grade, the stereotypical volcano experiment. Red food coloring + vinegar + Baking soda = one pretty sweet volcano. Even at the cute little age of nine I realized that baking soda and vinegar were two ingredients that we cook with on a pretty regular basis, and I was convinced that I would blow up if I ever ate the two together. When I was teaching this experiment to my younger cousin a few years ago I was trying to explain what ingredients we had to use, but he had a different idea. Instead of the standard vinegar and baking soda we used Mentos and Coke; it had the same (yet stickier) result. 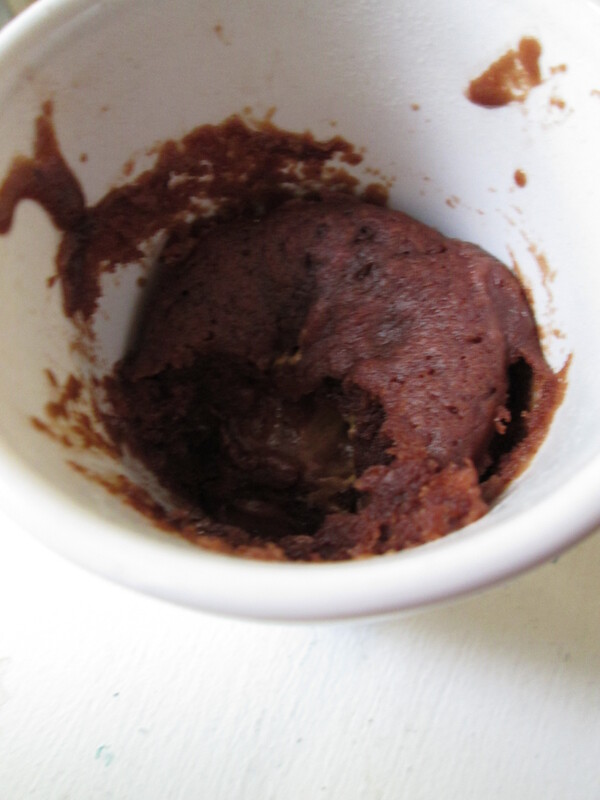 Today I am going to teach you a miracle of science: Chocolate Peanut Butter Mug Cake. It is the perfect treat for when you are banging your head against the table trying to remember those annoying chemical formulas and you wish you could just make up your own. Mix together the flour, sugar, cocoa powder, baking powder and salt until mixed and all the clumps are out. Stir in the milk and oil until smooth. Throw in the chocolate chips and mix them around a bit. Finally put the peanut butter in but make sure you get it under some of the wet mixture. 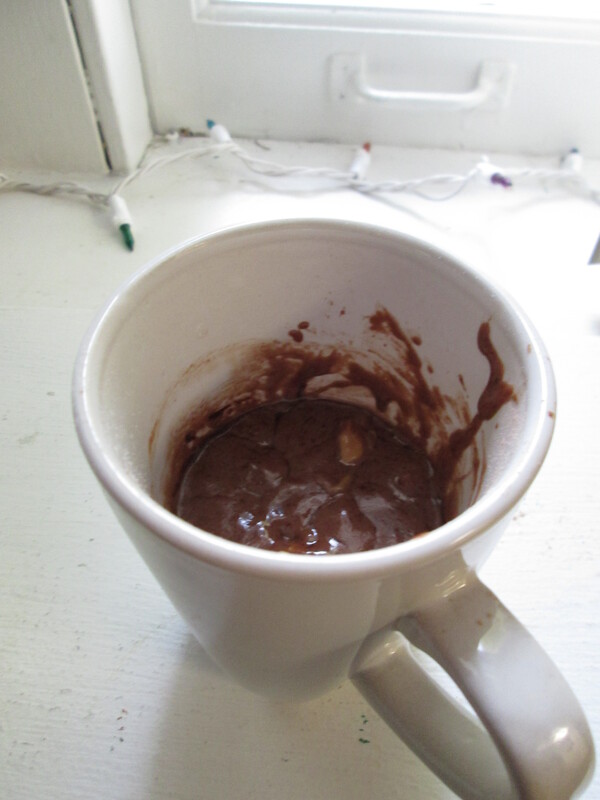 Put it in the microwave for about a minute, let cool for a few seconds and eat as fast as possible. Science is pretty cool isn’t it? You can turn a list of several ingredients into a masterpiece of edible art. 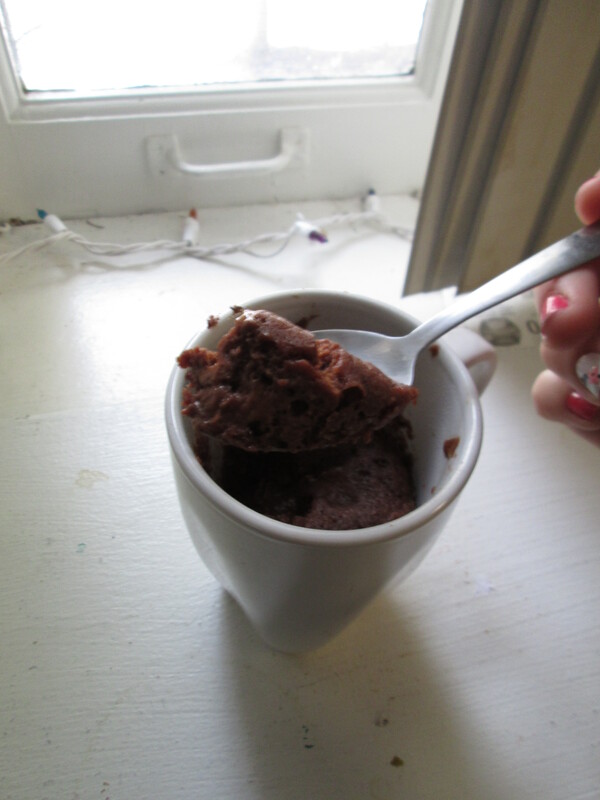 Now if only my professors would accept my homework in the form of mug cakes. Look at that melted peanut butter.